Commonly known as blueprints, Traverse Repro has been doing construction printing since 1953. Our attention to detail is what separates Traverse Repro from other reprographic companies. We know that we are the last set of eyes that will see you documents before they go to bid, and we make it a standard practice to make sure that every set of documents perfectly meets the order set out in the sheet index, and that each set of documents stands as a reflection of the architect, engineer or contractor that designed them. That starts the moment that we receive you files. We have made significant software investments in a file processing solution called PLP PlotWorks Pro that processes each file in prepapration for printing, aligning the documents, rotating each sheet, cropping and sequencing the plans into the perfect package of construction documents. At Traverse Repro, we understand the bid document process. So why would you trust your bid specification books to someone that has no experience with the same process? Next time, bring your specs to Traverse Repro. We specialize in making sure that your documents are complete, section by section, and we are meticulous about making sure every assembled specification book meets the standards you require, whether printing in color or black & white. 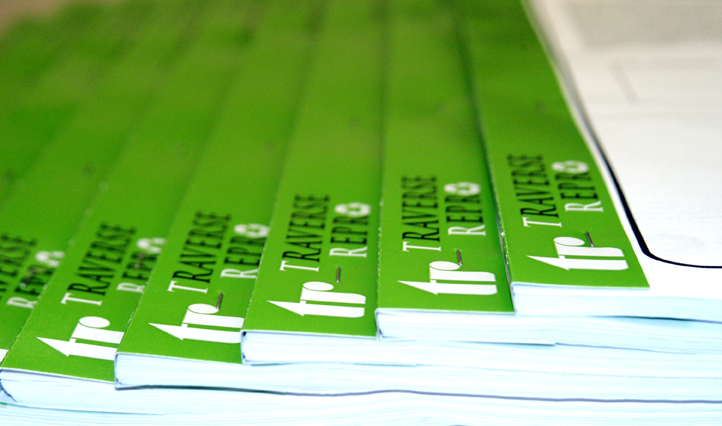 We offer four differrent types of binding at Traverse Repro for specbooks, brochures and reports, ensuring that each book is bound with the solution that best fits that the project. When a customer sends a construction specification print job to Traverse Repro, they do so knowing that it will be setup properly. At Traverse Repro, we follow the specification standards setup by the AIA’s MasterSpec guide for specification standards. We also are well versed on the standards setup by the Construction Specifications Institute, through their MasterFormat guidelines. When a specbook leaves our shop, you can rest assured that it will respect the requirements for sections, divisions and forms. Every section listed on the table of contents will be printed double-sided, and will contain and even number of pages to ensure each section begins on the right side of an open book.